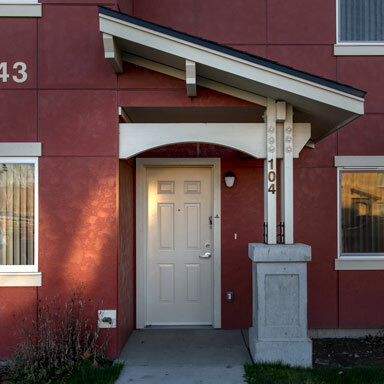 We build affordable housing projects all across the Pacific Northwest. New construction, occupied renovation, farm worker and labor force housing … we have experience in this field that few other contractors can match.That said, our greatest asset is the fact that we truly care about the success of your project and the people you serve.We're not just knowledgeable. We're profoundly motivated.We'll help you make the most of your funding dollars. We can guide you and your team early in the project development so you can plan for actual site conditions, develop an accurate budget and forecast for an appropriate scope of work. Microscheduling. Selective remodeling. A dedicated relocation specialist. These are just some of the ways we can meet the unique needs of your project. For us, construction is about building structures and relationships that endure. And that means we're there for you with comprehensive warranty support well after the project is complete. We work with extraordinary, mission-driven housing providers throughout our region who are doing their part to help able-bodied people transcend poverty, care for the disabled and elderly and provide housing for an essential agricultural labor force. … even if it means we have to spend some time on the road. 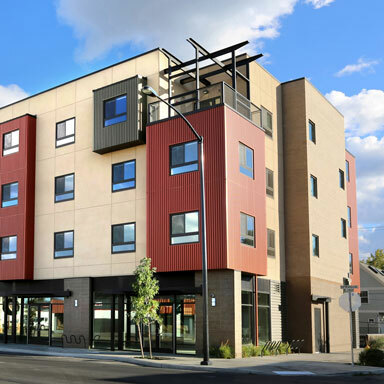 In West Spokane’s Downtown District, this construction project was a remodel of an existing warehouse structure into 50 units of affordable workforce housing with provisions made to retain the historical building renovation standards. Construction materials and details included seismic reinforcement of footings, multiple shear walls, a combination of wood and steel stud framing, upgraded floor finishes and solid surface countertops. 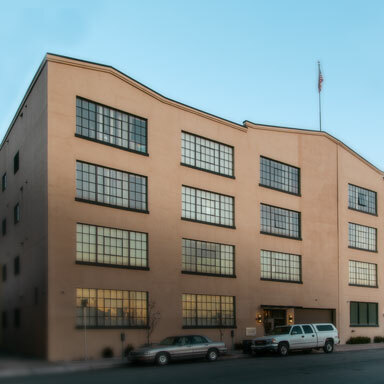 The warehouse style steel windows were upgraded with insulated glazing panes and the existing wood framed windows were replaced with maintenance friendly aluminum clad wood units. 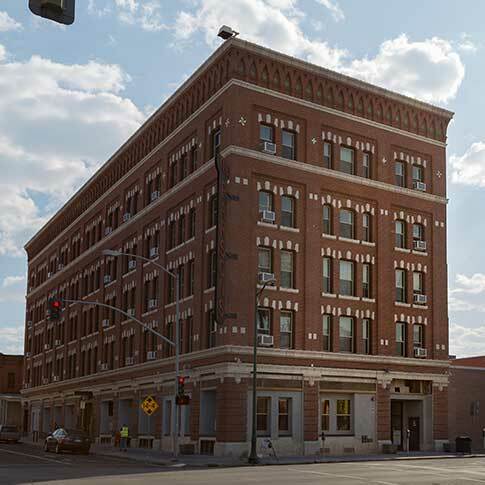 This historic building now has energy-efficient boilers and cooling systems, as well as “energy star” rated appliances selected to help keep operating costs down for both owner and tenant. Amenities include an exercise room, reading room, and limited off-street parking. This affordable housing project provides quality attractive housing for more than 75 farm and orchard workers and their families. 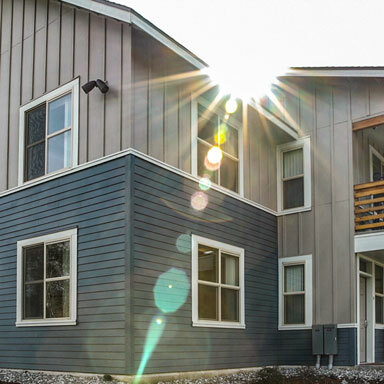 The development consists of 10 two-bedroom units conﬁgured into ﬁve single-story duplexes, a single-story utility building, and a single-story manager’s unit. Units are wood-framed construction over crawl spaces with cement board siding and ﬁberglass/asphalt shingle roofs. Solar panels will help oﬀset energy costs. This project was designed to meet Evergreen Sustainability Development Standards. Occupied selective renovation of 38 units of housing for seniors. Owned by the Yakima Housing Authority, this GC/CM project is located on the west side of Yakima and is a three story structure. 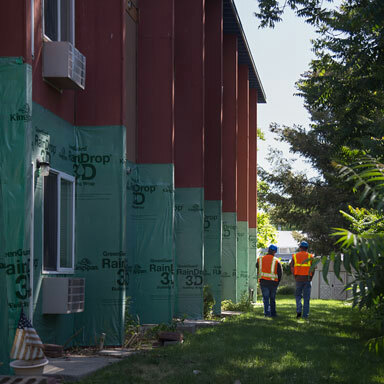 Work included full-exterior envelope renovation along with improvements to site concrete, asphalt repairs, and landscape. This project was designed to meet the Evergreen Sustainability Development Standards. 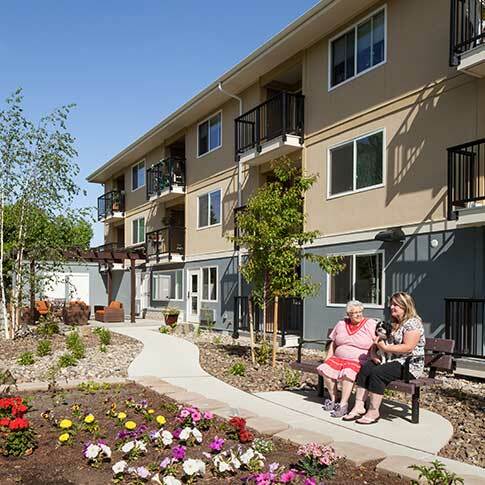 This project consisted of the renovation of a four story structure and 41 units of occupied senior housing. Renovation included the reconfiguration of existing unit kitchens, all new plumbing fixtures, HVAC equipment, flooring finishes and painted wall surfaces. Doors and windows were replaced throughout. The building exterior received an acrylic finish over existing stucco, along with new fiber cement siding over some wood siding elements. Existing parking lot and drives were removed and new pavement placed as well as new sidewalks and landscape. This project meets Evergreen Sustainable Development Standards. 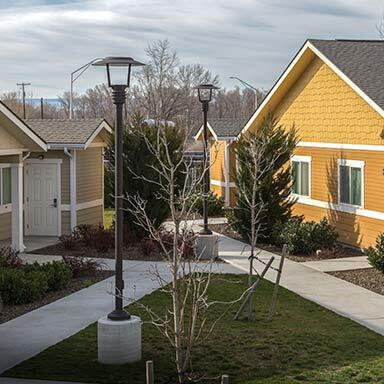 This new 38 unit community is designed to provide quality affordable housing to large agricultural families in Pasco and surrounding areas. It features 24 two-bedroom units, 12 three-bedroom units, and two four-bedroom units. This project was designed to meet the Evergreen Sustainability Development Standards. 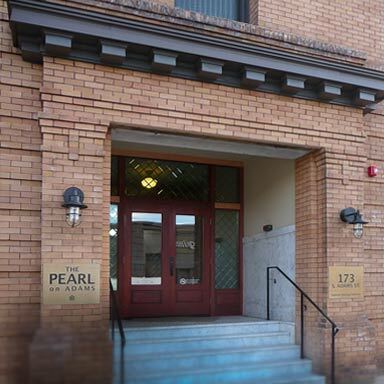 This project is an historical preservation and renovation of the Helen Apartment Building in the downtown Spokane area. 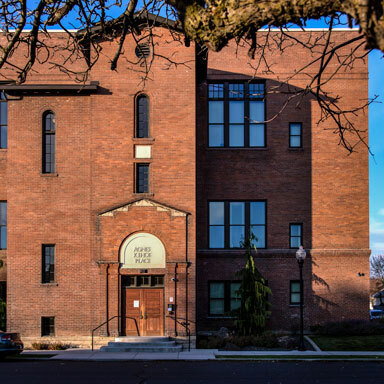 This apartment building accommodates 33 one bedroom units across four separate floors, with a total of 27,400 SF. Multifaceted financing included Historic Tax Credits and Federal HUD Funds. Documentation requirements included certified payrolls, apprenticeship participation and certification of “Built Green” sustainable construction credits. The Sprague Union Terrace project is one of the several catalysts for the revitalization of East Sprague, where Spokane's University and the International Districts meet. A four story, 38,000 square foot mixed use structure with wood frame construction and elements of masonry. Ground floor includes two commercial suites. Second through fourth levels consist of 37 total units of affordable housing. 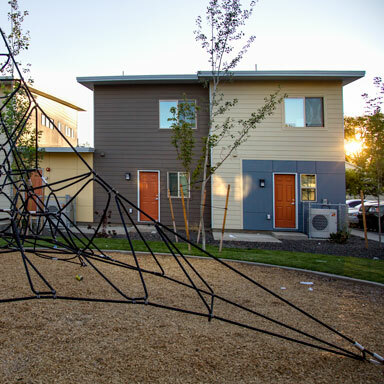 The project is financed through many resources which include the Washington State Housing Trust Fund, and Neighborhood Sustainability Funds. This project meets Evergreen Sustainability Development Standards. This renovation of 150 units was spread across 46 buildings and 13 different project sites. All but a few of the units were fully occupied. Interior renovation included new floor finishes, cabinets, plumbing, and electrical fixtures. Exterior renovations included roof replacement, siding, insulation, structural sheathing and painting. Windows and doors were replaced at most sites. Site improvements included accessibility upgrades at parking and sidewalk areas along with replacing wood framed decks with concrete patios. This project was designed to meet the Evergreen Sustainability Development Standards. 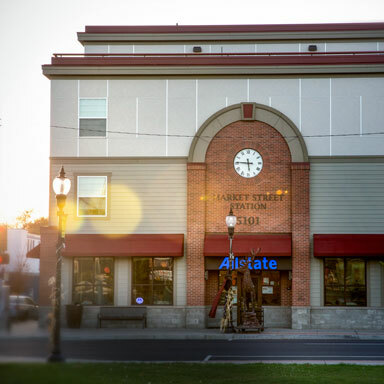 With a focus on providing affordable housing for elderly and disabled residents, this project's design and interior decoration was created in honor of the railroad history of the Hillyard area in north Spokane. Funding for the 37,000 SF building was primarily from the State Housing Fund. 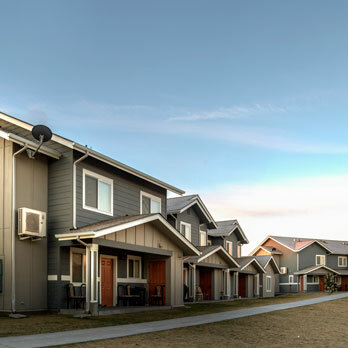 This project is 30 units of townhome style affordable housing across eight buildings in Toppenish, WA. Total building square footage is 35,287 SF. This project meets Evergreen Sustainability Development Standards. By some estimates, about 13% of Washington State residents fall below the poverty line and their need for housing outstrips our regional inventory. My team and I are proud to be able to come alongside affordable housing providers who are committed to responding to this housing crisis. 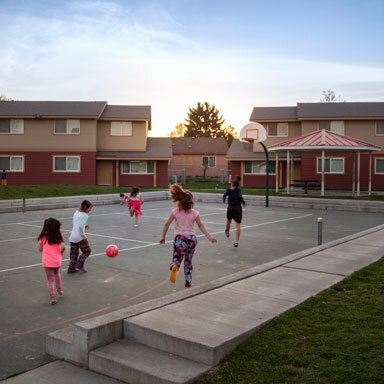 There's nothing more satisfying than to go back and revisit some of our projects and see tenants taking pride in where they live — or to hear the stories of people who have been positively impacted by having a safe, affordable home. It can literally transform lives. Housing — shelter — is a basic human need. It's essential. And because it's essential, it's essential to build it right. My background is as an active duty and reserve Marine. I like clear directives. And our team has distilled our approach into four imperatives: Integrity. Communication. Transparency. Teamwork. This field of construction is our way of making the world a little better place. And I think that's a beautiful reason to build.